J Jayalalithaa’s legions of devotees had immolated themselves in her defence in the past but when their beloved Amma died on Monday night, they were strangely calm and disciplined in mourning.Her party, the AIADMK, said late on Wednesday that 77 people died of shock across Tamil Nadu following news that their resilient Amma couldn’t pull through after a cardiac arrest. It promised to pay Rs 300,000 each to the families of the deceased. Official reports put the death toll at nine till evening. But whatever the number, it could have been a nightmare had Amma’s supporters behaved the way they did when she was arrested in September 2014 after a Bengaluru trial court convicted her of corruption in a disproportionate assets case. About 244 people died of shock or committed suicide then, while mobs ran riot. “Police prepared very well … did barricading for crowd control, which was effective. They factored in every aspect of the situation, drawing from past experience and placed policemen and rapid action force (RAF) units wherever needed,” said R Natraj, an AIADMK legislator and a former director general of police. Barring frayed tempers and minor scuffles, the state and its capital, Chennai, remained peaceful. Thousands of mourners filed into the landmark Marina beach for a final salute at the grave of the 68-year-old former chief minister and matinee idol. They wailed and beat their chests, but remained disciplined. The reasons are not far to seek. The AIADMK leader’s prolonged illness since September, the month she was admitted to Apollo Hospitals, and her oscillating health gave the administration and the people enough time to prepare for the inevitable. Since news about her health came out of Apollo Hospitals and the party in fits and starts, people were prepared for the eventuality, said psychologist Chitra Arvind of Manas, an NGO. Even die-hard supporters were reconciled to the inescapable fate — this is a natural death, an act of god. “Word went out to the party’s rank and file to maintain strict discipline as it was the greatest homage that they could pay to Amma … not to bring discredit to the party,” said C Ponnaian, an AIADMK spokesperson. Pickets and preemptive action checked the outbreak of violence, while meticulous preparation helped manage a sea of crowd and VVIPs who turned up during Jayalalithaa’s burial on Tuesday. Across Tamil Nadu, about 100,000 police personnel were deployed, their leaves cancelled. In Chennai, 10,000 rookie constables and 1,000 trainee sub-inspectors were on duty, supplementing the regular security set-up. A police officer said the closure of state-run Tasmac liquor shops for three days helped too because there were fewer drunken brawls that could have escalated into mass violence. Jayaram Jayalalithaa, a popular movie star who rose to become one of India’s most powerful regional leaders, has died. She was 68. 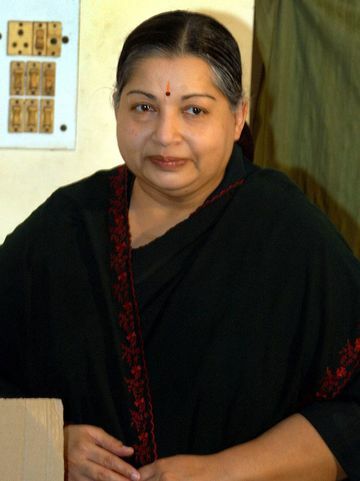 She died at 11:30 p.m. local time on Monday at Apollo Hospital in Chennai, the capital of the southern state of Tamil Nadu where she was chief minister, the hospital said in a statement. She was hospitalized on Sept. 22 to treat fever and dehydration, and died following a cardiac arrest on Dec. 4. The colorful and controversial politician had faced a series of high and lows. Her supporters said she steered Tamil Nadu to development and economic growth, making the state a base for companies including Dell Inc. and Hyundai Motor Co. Her critics said she established a personality cult, involved in corruption and indulged in extravagant expenditure. “Our beloved leader, The Iron Lady of India, Puratchi Thalaivi Amma, is no more,” her party said on its official Twitter account. Jayalalithaa’s death could trigger public expressions of grief among her supporters, who in the past had shown devotion to their ‘Amma’ — ‘mother’ or ‘goddess’ in the local language — by painting her portrait in blood and walking on hot coals. Police blocked traffic on some roads in Chennai leading to the hospital where Jayalalithaa was hospitalized. Like many politicians in southern India, Jayalalithaa used a past in the popular Tamil-language cinema and in particular her closeness to M.G. Ramachandran, a movie hero who founded the All India Anna Dravida Munnetra Kazhagam party, to build a political base. Under her leadership, the AIADMK started several welfare programs to supply cheap food and medicines to the poor, all named after Jayalalithaa. She also led the party to greater influence, allying with the Bharatiya Janata Party in 1998 to form a national government that collapsed after 13 months when she withdrew support. The troughs and peaks continued. Jayalalithaa spent three weeks in prison on corruption charges in 2014 before a high court cleared her. After being physically attacked amid the state assembly in 1989, the Rock Hudson fan who considered green her lucky color became the first in decades to win consecutive terms in Tamil Nadu. Her national ambitions, however, remained unfulfilled.